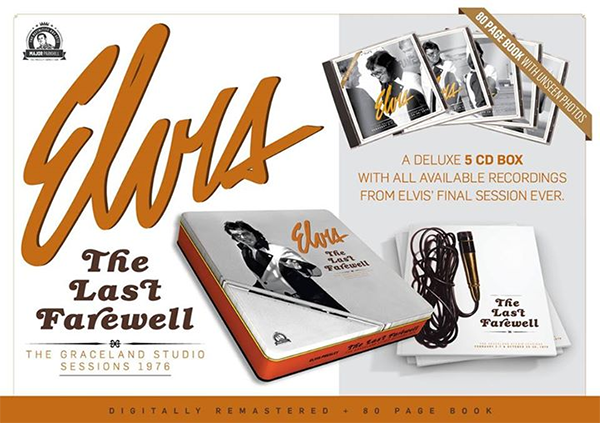 We found this announcement of a five CD set by the Parkhill label, containing al material available from Elvis' last recording sessions. This is a ok release for fans who dont own the VENUS releases ....and FTD. For the rest of us its only a metal box and some pictures that is new....... Looking at the tracklist, everything is taken from FTD, Venus Unedited Masters, Venus Welcome To The Jungle ++ Worst is the price, my dealer wants 150 USD including postage. They didn't even stock the complete basement tapes at the local record shop, never mind this. Saying that though I once got a double act cd, Moody Blue and Boulevard and I gotta say its most enjoyable, the voice deep and rich, the extra weight had its benefits, maybe it was the cop uniform he was wearing, arrest me Elvis. My favourite cop, we know he deserted Rock 'n' Roll for good reasons, the dude heard Roadhouse Blues. Of course it is interesting for those who dont have the originals and cannot find them any more. Better than nothing at all. But this counts for all of these dubious compilations.. There's little doubt most if not all of the contents have been released before. The fact is, for those who haven't already got this stuff, this looks like a good way to get it. (no reason to OK it with Cisko). To Johnny2523: wait some weeks and you will give reason to Cisko. Could be an interesting release. I love session material and I want all the takes that are avaliable to complete my collection . I know some are not great fans of the studio banter but I am and yes I know the music is the most important aspect. I have both FTDs from these sessions and for the most part I think they are fantastic. I have however heard that FTD sugar coated and cut some of the studio talk and that from a collectors label disappoints me. I very much hope that when the tracklist is published it will contain the missing takes left off the FTDs and the full studio talk uncut and untampered with. oh and secondly not everything has been released from these sessions.. she thinks i still care FS take 5 and complete takes 6 and 16 are unreleased thus far. solitaire long false start take 6 is unreleased. moody blue take 2 is unreleased/. i'll never fall in love again takes 6,7,8,10 & 11 are unreleased. blue eyes crying in the rain FS take 3 is unreleased. So if these are on here, It means we atleast get some new stuff.. but again we dont know anything so its hard to judge as of now. I wonder why cisco is already saying this is stolen from venus and FTD.. We don't even know the contents yet. and be it.. to have this all together would be nice. considering the ''Welcome To The Jungle'' series by venus, aren't that easy to come by,and probably together will cost you a bunch more then it will to have this slick looking set. I don't see the problem. Bootleggers steal from each other all the time, and every bootleg is illigal. Now if it indeed stole from ftd i can see why people could get upset.. but we don't have a tracklisting, we don't even have a sound sample so in that case, let's give it the benefit of the doubt until its released and we know more.. shall we? Good only for new fans. Everything is already released. You would only describe it as "crap" if the sound was bad, the packaging was shoddy etc. It looks anything BUT crap from the pictures above. As I've already said, to describe it this way merely because they're copying another illegal product is farcical. As for the guys at Venus paying for the tapes, who I wonder did they buy them from? Sure as hell not the legal owners! Maybe it is CRAP. But i don't have the Venus cd's. And when i find it, they asked a lot of money for it. For the people who also don't have it it will be a nice addition. Bootleg or not.But why should they work on the sound if it is stolen from Venus and FTD?.What have to change ?. Stolen from Venus!!!! That would be the illegal bootleg label right - come on. If we're going to get sniffy about stuff being stolen from FTD (Sony) then let's condemn ALL bootlegs (which I don't by the way). Talk about double standards. Looks nicely presented to me. I'll never understand the view that if someone covers the same ground as a previous bootlegger, it's "crap". Of course the last thing on the minds of the Venus people was to "make a quick buck". Quick buck...C-R-A-P....stick to tjhe originals ..be it FTD or Venus..
i think it will be good to have all the sessions in chronological order and in one place, i did not get round to buying the FTD releases apart from the Jungle room sessions so depending on the price i may purchase this set ! A waste of time and money as most fans will have the cds content already.